Ancient Egypt was a civilization located in North Africa concentrated along the Nile River. For almost 30 centuries from its unification around 3100 B.C to its conquest by Alexander the Great in 332 B.C ancient Egypt was the dominate civilization in the Mediterranean world. 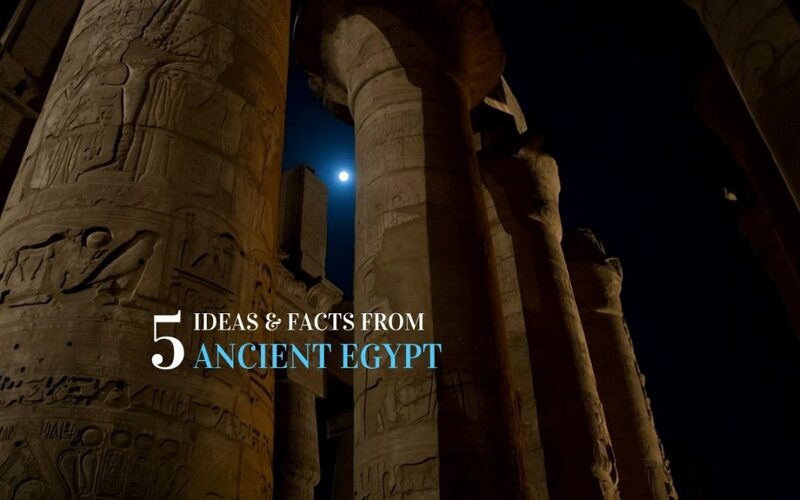 The following are 5 fascinating ideas from Ancient Egypt. Mummification is likely to be the first thing people associate with ancient Egypt. The Egyptian embalmers were so skilled at their profession that bodies mummified four thousand years ago are still recognisable today. Tattoo designs, hair styles, and scarring can be identified, providing valuable knowledge for historians today. The purpose mummification was so the deceased soul could travel through the underworld while their preserved body remained in the tomb. The mummy would remain protected and safe. Once the soul had completed its journey it could return to its body and which would serve it in the afterlife. The quality of mummification varied depending on what the family could afford. The earliest and cheapest methods involved burying the dead in small pits in the desert and allowing dryness and heat of the sand to naturally dehydrate the bodies. The costliest methods involved drawing out the brain through the nostrils. Then all the internal organs except the heart (which was needed by the deceased for their final judgement) was removed. The organs were placed into vases called Canopic Jars. The body was then flushed with wine and spices. The belly would be filled with myrrh and cassia before being sewed together again. Covering the body for seventy day before washing the corpse and wrapping it in fine linen. Pyramids were used as royal tombs as the ancient Egyptians believed they assisted the souls of royalty to ascend to the afterlife. The pyramid’s smooth, angled sides symbolized the rays of the sun. 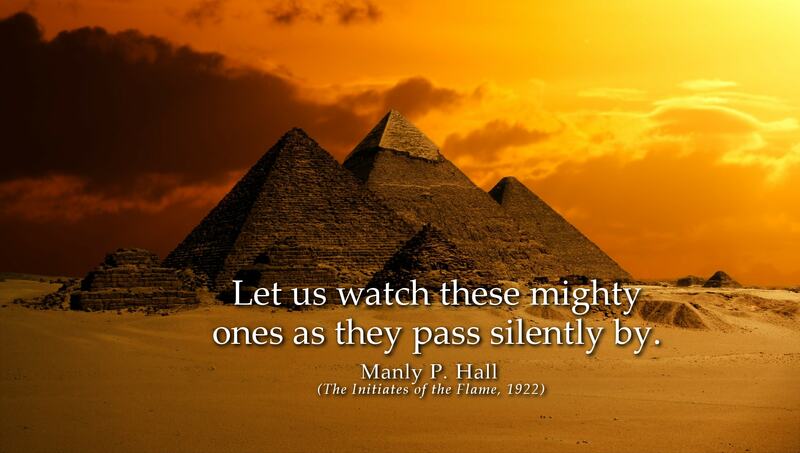 As well as assisting the deceased in their journey, the pyramids were also used to protect and store all the worldly processions the deceased would need in the afterlife. The earliest pyramids were likely built from mud bricks which have not survived. The earliest known surviving pyramid in Egypt is called the Step Pyramid and was built around 2630 B.C. The Step Pyramid was built at Saqqara for the third dynasty’s King Djoser. According to legend the pyramids’ architect was a priest and healer called Imhotep who 1,400 years later would be referred to as the patron saint of scribes and physicians. The Great Pyramids of Giza are the most famous pyramids in the world and are located on the west bank of the Nile River on the outskirts of the modern city of Cairo. The oldest and largest of these pyramids in the only surviving ancient wonder of the world. Its construction began around 2580 BC shortly after Khufu became pharaoh and was completed about 20 years later in 2560 BC. The three smaller pyramids built next to the Great Pyramid were for Khufu’s wives. The Ancient Egyptians wrote with picture words called Hieroglyphics, which was used as early as 3000 B.C. The Hieroglyphic language featured over 1000 symbols and dates back as far as 3000 B.C. Some of the symbols represented sounds like English letters but others represented whole words. Hieroglyphics were designed to look visually appealing as it was written on potteries, temple walls and on papyrus paper. Hieroglyphics did not use punctuation and could be read in almost any direction. The average ancient Egyptian could not read or write. Scribes were given the task of writing and recording, their education started young from the age of six or seven years old. Scribes were highly regarded in Egyptian culture as they were able to communicate with the gods and goddesses by using Hieroglyphics. In 1799 a French soldier discovered a special stone known as The Rosetta Stone. The stone had the same message written in both Greek and Hieroglyphics and allowed researchers to translate the Hieroglyphics. According to the historian James Thompson, Egypt treated its women better than any of the other major civilizations of the ancient world. Women were permitted to own land, houses, run businesses, initiate divorce, appear in court as witnesses, preside over temples and even in rare cases become pharaohs. The ancient Egyptians believed that family and the home were vital to their happiness. Men were considered the head of the house, but women were regarded as the head of the home. Women raised children of both sexes until the age of five when boys would be taken under the care of their fathers to learn their profession or attend education if their fathers were doctors, scribes or priests. Girl children usually remained under the care of their mothers, learning how to run a household usually until they themselves married. Women could also become scribes, priests or doctors as well, but this was rare. The reason for this was the costs involved in education, and the tradition that sons should follow their father’s professions. Women usually only went into these professions if there were no sons in the family or if she was regarded to be especially talented. Beauty and cosmetics were considered an integral part of everyday life for the ancient Egyptians. Both men and women wore makeup as it was considered a sign of holiness. Cosmetics also served many practical purposes such as protecting skin and eyes from the hot desert sun and avoiding insect bites. Ancient Egyptians used black paint to decorate their eyes. The paint was made from powdered kohl. Kohl contained heavy metals with high concentrations of lead salts which was filtered to create the first eyeliner prototype. Lead contamination was dangerous, but the process involved filtering over 30 days which reduced the levels. This first eyeliner prototype provided protection for their eyes from the sun as well as boosting the skin’s ability to fight off infections. The Egyptians also used green paint to decorate their eyes which was derived from malachite power and was also applied to the eyes to make them appear larger. The colour green was believed to invoke the eye of Horus, the god of the sky, sun and healing. Therefore, Egyptians believed that wearing the colour green on their eyes provided protection. Heads were often shaved, and wigs made of human and horse hair decorated with ornaments were worn especially by the wealthy classes. Henna was also used to dye their hair, skin and fingernails.